University Mail Services strives to provide courteous, cost effective, high quality mail services to our customers. We work exclusively with the United States Postal Service. Items sent or received via FedEx or UPS are done outside of our department. We provide mailing supplies free of charge. Please contact us if you need any additional intercampus mail envelopes, postage charge forms, or departmental barcodes. Once a day, campus mail is picked up, sorted and distributed throughout the campus. A button-and-string interdepartmental envelope (no postage required) should be used to send mail to another department. You may request these from a Mail Services representative. Be sure to cross out all previous names and addresses. Campus mail cannot be used for personal or any non-university businesses. 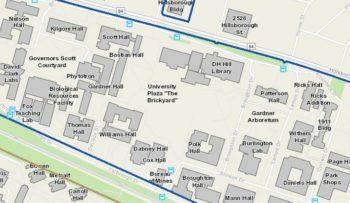 We use the “campus mail box” to identify delivery locations within the University. Each department has been assigned a four (4) digit campus box number. The University directory lists box numbers for individuals. Use campus box numbers as part of your return address for external mail. The campus box number is also the + 4 of your ZIP code. University Housing/Student Mail – NC State Mail Services does not handle, sort, or deliver student/housing/dorm mail or packages.